Shamrock FC was center stage at the Ameristar Casino Kansas City on Saturday night. 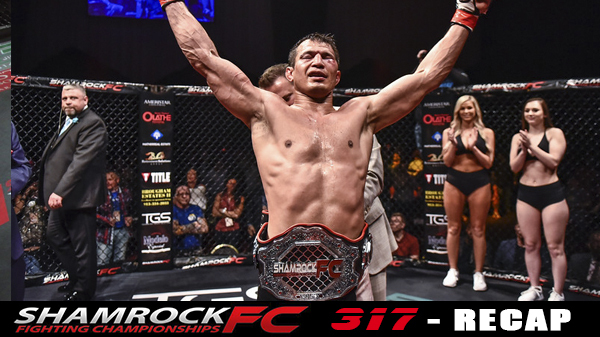 While most were worried with busted brackets and buzzer beaters, Shamrock FC served up three thrilling title fights with the main event featuring local favorite "Vicious" Bobby Voelker. It wouldn't be a Bobby Voelker fight without a few tense moments. Saturday's affair was a five round classic with Voelker's opponent Cameron Vancamp ready and willing to play the villain. Early it looked like he would play the spoiler with the fight starting in his favor. During wild exchanges Vancamp was connecting more often. Two Flying knees by VanCamp in the third quieted the crowd and had SFC President Jesse Finney on the edge of his seat, but Voelker's granite chin kept him in the fight. "You know, that chin held up great tonight," Voelker said. "He lit me up with some good shots tonight, but I kept on taking them, kept on coming forward. It was back and forth, back and forth. I got some good takedowns that really sealed it up for me I think, but it got me the win tonight, got me that belt, got me that contract." A broken nose for Vancamp made breathing a problem and Voelker used the fatigue to his advantage. A late surge in the 3rd by Voelker had him looking good going to the fourth round. However, a large mouse under Voelker's left eye hindered his vision and allowed Vancamp to connect repeatedly with his right. Voelker secured a takedown in the middle of the fourth, and worked some effective ground and pound. "Bobby is one of those guys that if you don't put him away early, good luck putting him away later," Finney said. "If you look at those losses he's had, for one they weren't five rounders, and two they just laid on him for fifteen minutes." The final round was make or break for both. Voelker uncharacteristically went for the takedown early and controlled the ground dropping elbows when able. It was a war that ended with both fighters exhausted and battered. "It's the old school way, the tough-nut, dig deep, who cares about the pain way, that brings the monster out." Voelker said. "It brings the new you, the monster out, and that's what I had to do in that fifth round. I just had to drive and drive and drive until either he was finished or I dropped dead." Voelker wins with a unanimous decision claiming the SFC welterweight title belt. Along with the belt Voelker claims a four fight contract with Bellator. This may have been the last local fight for Voelker in Kansas City, but his fans enjoyed the send off and will be watching him on the Paramount network very soon. "He's getting better with age, he's getting in better shape with age. If you think about it, he's had over 100 MMA fights between amateur and pros," Finney said. "I'm proud of him, he's got a 4-fight deal with Bellator. We'll sign it on Monday." Going into the bout Vancamp had only lost 2 of his last 12 professional fights, and showed he is a force to be reckoned with. Voelker improves to 33-13, taking home the shiny new Shamrock FC belt in the process. The co-main event was another long battle between two of the best the Midwest have to offer in a bantamweight match-up between Jacob Thrall and Cortavious Romious. This fight had a lot of pre-fight hype and trash talk, with Thrall doing most of the lifting when it came to press. The fight started wild as both came in swinging. Thrall eventually forced a tie-up with Romious and the fight went to the ground. For all three round it was mostly a ground battle. Each time Thrall would gain the advantage, it was only momentary as a scramble would occur and end with Romious on top and dropping elbows. "I felt like going into this fight I was going to be the smarter fighter," Romious said. "I felt stronger, quicker, more technical. He had said most of the fight was going to be spent on the ground with him on the top, so I went out there and proved him wrong. I was the one who was on top of the majority of the fight, he was one top a few times, but he didn't really do anything. Overall, I felt like I dominated." Romious won the match with a unanimous decision and is now 4-0. "I want to continue my win streak," Romious said. "Hopefully this fight will open up more doors so that I can get closer to where I'm trying to get at. I'm going to take down everybody that stands in front of me and keep doing what I doing." 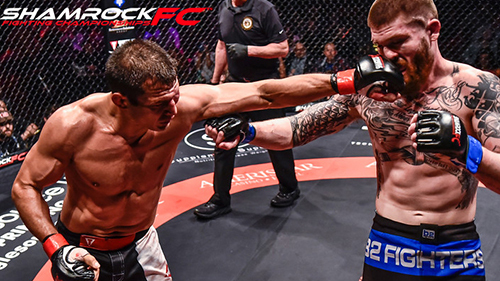 Shamrock FC and Jesse Finney like to bring many combat sports to the attention of the audience, and Saturday's main card featured a pro kickboxing fight between Brad Ragan and Brandon Breault. The long and lanky Ragan was able to exploit his reach in the unanimous decision victory over Breault. The main card opener was the bantamweight title unification fight between Tim Jackson and Travis Sumler. Jackson's superior stand up and takedown defense stymied Sumler's jiu-jitsu ground game. "I knew he had good 'jits, so we worked on 'jits, a lot of arm bars," Jackson said. "I've seen he's finished a lot of fights with arm bars and triangles, so I perfected that and took his best aspect away from him." In the third round an overhand right from Jackson dropped Sumler stiff forcing the ref to intervene. Jackson wins with a KO at 2:35 in the third and unifies the SFC amateur title staying undefeated and improving to 6-0 as an amateur. The finale of the undercard was a three round battle for the SFC light heavyweight title. Jeremy White versus Andrew Floyd. This fight had a bit of Army / Navy flavor with White serving in the army and Floyd formerly in the marines. Both came out willing to bang. White knew the power and toughness of Floyd and came in with a game plan to strike and back out. White rocked Floyd early but Floyd's wrestling instincts and toughness allowed him to regain composure. "I've seen him fight online a couple times, hes' got an iron chin." White said. "I was really surprised when I dropped him early, but he recovered. I backed off really quick when I realized this wasn't it, and went back to my fight plan." White continued to pick his spots. With good head movement he would counter strike and then back out. He continued this throughout all three round and earned the unanimous decision victory. "We knew he was strong, he wasn't going to get put down with one or two strikes," White said. "We knew it was going to take wearing him down and going into the third round and potentially putting him away then. In the third I think I scored one good head kick on him, looked like I rocked him, but then again he started to recover so I wanted to go back fighting smart and not fight his game." White out of Glory MMA and Fitness improves to 4-1 as an amateur. 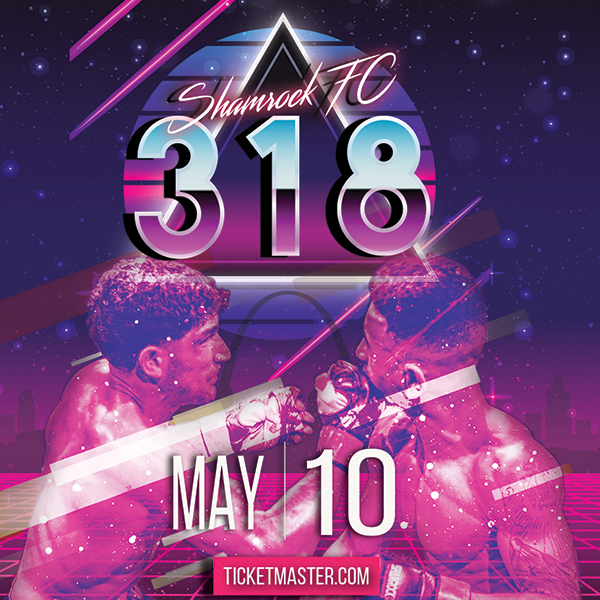 Shamrock FC returns to KC in June for SFC 319.